Strong plastic bags with a waterproof fastening. Light, fairly cheap and very useful, they come in all sizes to keep equipment and spare clothes dry. This particular one has a transparent panel so you can see what's inside. Small drybags to protect cameras and mobile phones are usually made of transparent, rubbery polyurethane foil welded into the shape of an envelope with one open end. To seal them, you make sure the open end is lying flat, then roll it tightly a couple of times and seal it by pressing together the velcro closure. Larger drybags come in all sizes, from those which are good for keys, money and a mobile phone up to those suitable for a sleeping bag. They are usually made of a thick nylon / PVC material. Most work in the same way as the small bags but the closure consists of a bar of semi-rigid nylon across the open end of the bag, with a buckle at each end. Again, you seal the bag by rolling the open end round the bar, then clip the buckles to stop it unrolling. Neither is 100% effective if your kayak floods and stays flooded for a long time, but they are pretty good. You can very easily make your own drybags. In the words of Seattle Fabrics, who sell a heat-sealable fabric so you can make seams with a domestic iron instead of needle and thread, "dry bags are one of the easiest outdoor gear projects". They despatch fabric worldwide, and instructions are available from their website. See Kayarchy Shopping. Some kayakers use "float bags", which are a combination of drybag and buoyancy bag. They can be put into the kayak through the hatches, filled with equipment which needs to stay dry, sealed up, and then inflated inside the boat. You get both reserve buoyancy and dry-ish storage for things like clothes. 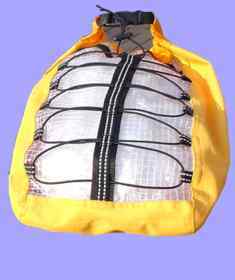 Float bags are even better if they are made of transparent material so you can check what is inside. Making these yourself is more problematic, because you need to inflate them through a tube. See Additional Flotation For Your Kayak. Cute, certainly, but worth having? These small-to-medium size nylon bags can be attached securely to the front deck of a kayak. A deck bag can be used to carry waterproof objects which do not easily fit into the pocket on your jacket or buoyancy aid and which you might want while you are on the water. VHF radio, distress flares / smoke in a waterproof container, kit for patching a leaky kayak at sea, bottle of water, energy bar, waterproof camera. A deck bag may save having to take off your spraydeck or a hatch cover while afloat but some feel it is not really consistent with travelling light. Should have a low profile so that it does not catch the wind or make it hard to roll. For any sort of open boat, the most effective pump is without doubt a frightened man with a bucket. There isn't much room to wield a bucket or bailing scoop in a kayak so in the 1970s and 1980s a lot of British sea kayaks were fitted with a powerful lever-operated pump. It was built into the kayak and could be operated by hand or foot to empty out the cockpit. The water was pumped out through a hose attached to a "skin fitting" inserted into an outlet hole in the side or deck of the kayak. You don't see so many of them today. 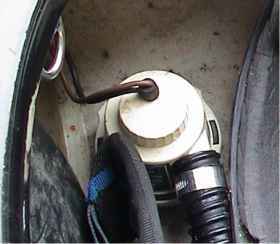 A built-in pump is expensive; will generally pump water out of the cockpit but not out of the rear watertight compartment or the front one; makes the kayak significantly heavier; and requires a large outlet hole to be drilled in the kayak's deck or hull. If the outlet hose is inadequately attached to the outlet hole and comes off at sea, your cockpit is going to flood no matter how hard you pump. You can operate a built-in hand-operated pump with only one hand, but that still means you can have only one hand for your paddle at a time when the flooded state of your kayak is making it unstable. Foot-operated pumps quickly give you cramp. If you fit an electric pump, it may not work when you want it. If your own kayak floods, it is very difficult to use any sort of pump except by rafting up next to another kayak. 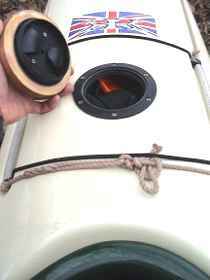 If you are rafted up with somebody you can have both hands free, so you could quickly pump out your cockpit and both watertight compartments using a portable pump. Many group leaders consider it OK to have no built-in pumps at all, as long as they take a couple of portable pumps for the whole group. Portable pumps look like a fat plastic bicycle pump. They are very light, quite cheap, very efficient and float if dropped in the sea but they're not very durable so two per group is better than one. Available from good kayaking shops. See Kayarchy Shopping. 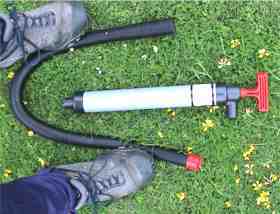 They are generally supplied with a detachable hose as in the photo but most kayakers leave this at home. Check whether yours floats, and if it doesn't, glue on a sheath cut from a closed-cell foam camping pad. Solo kayakers can't use a portable pump at sea unless they also carry a paddle float and take the time to set up a rigid rescue outrigger. That does not necessarily mean they need a built-in pump. If your kayak has two bulkheads, a closed-cell foam footrest and closed-cell foam pillar buoyancy in the cockpit area, it will still perform adequately even if the cockpit is fully flooded. If your kayak also has pillar buoyancy and/or buoyancy bags in the ends, you could get home safely even with both ends of the kayak knocked off and no spraydeck. See Additional Flotation For Your Kayak. 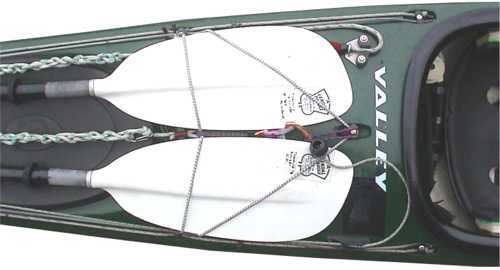 If you are going to do a lot of advanced trips where fog or long distances may prevent you looking for an object on land and just paddling towards it, it is a good idea to fit a deck compass to your kayak, with big numbers which are easy to read in bad conditions, and battery-powered illumination to make it easy to read at night. A deck compass is fragile and often expensive. It's a steering compass so all it does is tell you the direction your kayak is pointing. In any situation where you need a deck compass you also need a sighting compass. This means a hand-held compass which you will use to take occasional bearings on your destination and other objects. See Using A Compass Afloat. Generally a small, lightweight orienteering compass is adequate as a steering compass and a sighting compass. It is cheap and you can just slip it into your pocket. Some kayaks have a recess moulded into the front deck, of the right size to accept a Silva, Suunto or Rule deck compass. The recess is often down by the kayaker's feet rather than just in front of the cockpit, for two reasons. First, repeatedly looking down at a compass just in front of the cockpit can make you sea-sick. Second, if you have to carry out a deep-water rescue of another kayak you might damage a compass that was just by your cockpit. A very small hatch just in front of the cockpit. It opens into a small watertight compartment between your knees. See Knee Box / Knee Tube. Advantage? You can more easily reach objects such as flares which would otherwise be less accessible or at risk of getting soaked in a pocket or deck bag. Disadvantage? 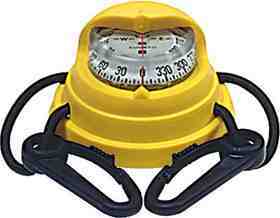 Weight, expense, possibility of damage during a deep-water rescue. A kayaker quite often needs to tow a friend. Your editor does whitewater as well as sea kayaking and he finds that the regular whitewater towbelt works just as well at sea. It's light, safe and versatile. See Tow-Belt and Paddle Park / Tow Point. One alternative is a towing system of rope, shock-absorber, camlock fairlead and cleat permanently attached to the rear deck. The system shown above is common but maybe not ideal. If the towline goes through the kayak's stern loop, more than 2 metres behind the kayaker, it is hard to steer when the casualty's kayak veers off to one side or tries to overtake the towing kayak on a wave. Built-in towing systems are usually bolted or riveted to the rear deck about 15 cm behind the cockpit. Both ends of the tow rope are just behind the cockpit where the kayaker can reach them. To take another kayak in tow, you reach behind, unclip the karabiner from the centre of the kayak and attach it to the bow loop of the casualty's kayak. In emergency such as the approach of a big breaking wave, you reach back with your left hand and pull upwards on the end of rope which you can see just above the letter V in Valley. The towline should be arranged so that it then detaches completely. In the photo, the full length of the rope is chain-coiled. That makes it very convenient line for attaching the kayak to a dock or getting it up or down a vertical ladder by the water. If it is used as a tow-rope the chain-coiling would prevent it running smoothly through the stern loop on emergency release. Useful if you do expeditions with a loaded kayak, or you have a bad back and need to get your boat in or out of the water across a smooth hard surface on your own. Or if you regularly transport your kayak considerable distances along the highway on foot or with a bicycle. This trolley has been parked temporarily on the rear deck of a heavy folding kayak, for a sortie on a freshwater loch in Scotland. The wheels can be removed to stow it inside the kayak. Here's the T-Bar design from Sandy Ferguson of New Zealand, which is light, robust and rustproof. You can make your own by following instructions on the KASK website. Last time we looked, the trolley page was here. See also the Boatcart page on Gerald Maroske's Kayak Origami. Here's an electric pump, fitted in the cockpit of a sea kayak between the back of the seat and the rear bulkhead, with the battery pack in the rear watertight compartment. We understand they are popular with Tasmanian kayakers. The owner of this one was rather disenchanted with it, and we've heard several stories about pumps that worked fine until the kayak filled with water. For alternatives, see Built-In Pump vs. Portable Pump, above. If you want electric accessories (torch, VHF radio, GPS) we recommend hand-held units. Electrical systems built into kayaks require you to make holes in the boat. Unless very carefully designed and made, they will quickly be corroded by the sea until they are useless. As to lamps and torches for night-time kayaking, see Night Navigation. Like a floppy spraydeck but without a hole for the kayaker. Useful if you live in a rainy climate and prefer to carry your kayak the right way up on your roof rack. Also useful on camping expeditions because it lets you carry equipment in the kayak instead of your crowded vehicle. • A partly concave rear deck for carrying the occasional exceptional load, such as an exhausted swimmer. See Deck Shape. • A pair of sockets in the side of the hull just above the waterline, so you can easily stick the halves of your spare paddle into them as a stabiliser. See Self-Rescue For Solo Sea Kayakers. Your editor had those for a while in a Nordkapp and suggests that the sockets need removable nylon blanking plugs, or they'll make a gulping noise all the time you're afloat. • A pair of hinged sockets on the rear deck of your kayak, to hold the ends of your spare paddle so that you can instantly swivel them out to the side as stabilising wings. • A pair of sockets in the rear to give a really solid attachment for a folding beach trolley. • Aluminium foil incorporated into the hull laminate to make it more reflective for radar. Effective, but apparently not effective enough to make a kayak stand out from wave clutter on the typical ship's radar. • Sockets in the side or deck of the kayak so that with a sailing kit you can quickly make sea kayaks into little trimarans or catamarans. See Sailing A Kayak. • A long thin groove at the keel so you can insert replaceable plastic wear strips. • Transparent panels in the deck so you can see your camping equipment. • Glass bottom. A transparent panel in the bottom of the cockpit, to see what's going on below. Rather a nice idea, but for half-decent visibility you also need a black cloth over your head to exclude light from the sky. A transparent panel in the bottom of a kayak will be heavy and fragile if made of glass, and if made of polycarbonate (with 250 times the impact resistance of glass) it will soon be badly scratched. Overall Kayarchy rating - "Hmm". • Buoyant paddle. The idea is that the paddle is slightly fatter than usual and hollow, so if you capsize you can just hold it out to the side of the kayak with one hand, and use it as a float to hip-flick back up again without knowing how to roll. An interesting idea but you still need an efficient hip-flick, and a novice who has an efficient hip-flick is 20 minutes tuition away from being able to roll. • Kayaker hydration system. A drink bottle built into a sea kayak? Hmm. • Personal tether. A waist belt with a short rope which attaches you to your kayak? Hmm. • Paddle leash. A short strap which attaches you to your paddle? Hmm. • Anchor & rope. Although there are times when you might like to have an anchor for your kayak (to stop for a rest when wind or tide are against you) we've never met anybody who had one. To be effective, an anchor needs to be quite heavy, especially if attached purely with rope and no chain, and it must be stored somewhere you can easily reach it. In the sort of conditions where you might be grateful for an anchor, you really don't want to be juggling with a heavy metal hook, 30 metres of anchor warp, or another 30 metres of tripping line to retrieve your anchor if it gets jammed between rocks. If you want a rest when there's wind or tide trying to push you the wrong way, the usual method is to land on a beach or find an eddy downtide from a rock. • Sea anchor & rope. A small underwater drogue parachute which you can deploy to stop your kayak drifting downwind. In his book Sea Kayaking (Greystone Books 2004) the expedition kayaker John Dowd mentions a trip he made from from Singapore south towards Australia, in which the group twice travelled more than 100 miles between landfalls. He provides details of sea anchors and advocates their use "on any journey with open sea to leeward". There's a chapter on survival in storms including running before a storm, lying to a drogue, hurricanes and typhoons, and sleeping in a kayak. • Fishing rod bracket. Fine if the usual mackerel-line-on-a-spool is not enough for you, and if your kayak is so wide that nothing short of a tsunami will capsize it. In general, see Fishing Kit. • Flag pole. One Kayarchy contributor once had a Klepper Aerius which he swears had a screw-in socket for a little flag pole. • Inflatable life raft in case you have to abandon kayak. No comment. • Parasol or bimini top. No comment. • Engine, outboard. In February 2009 a German company, which we are not going to name in case it encourages them, launched "the first true kayak motor". An electric motor weighing 7 kg, it has a lithium-manganese battery and a conventional propellor on the end of a jointed arm, one end of which you attach to your deck. • Engine, inboard. Jeremy Clarkson's Top Gear television programme featured a playboat kayak which was powered by a jet ski engine and had spectacular performance on flat water. Try not to hit any waves while doing 30 knots, unless you want to take off and cartwheel. Could be the answer to getting arrested in France for failing to register your sea kayak or venturing too far away from the shore... just fire up the engine and disappear over the horizon, leaving the CRS patrol boat far behind. See French Law.